Getting All Technical – Should We Be Alarmed? The term technical analysis conjures up lots of strong emotions in people. Some love it and rely on it exclusively for their investment decisions. Others despise it and won’t touch it with a ten foot pole. Yet others use it as part of their overall investment strategy. 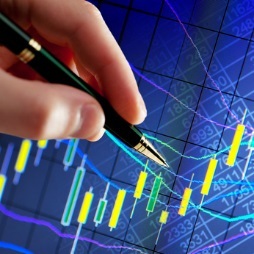 There is probably no greater disconnect in finance as that between people that believe in technical analysis and those schooled in more traditional methods of analysis. While technical analysis takes many shapes and forms probably the most common expression of technical analysis involves trend following. Basically the idea behind trend following is that the stronger will continue to get stronger and the weak will continue to grow weaker. What is left unsaid is that clearly, there is always a point at which “things change” and the revenge of the trend plays out. While technicians swear by their trend following methodologies even academics employing an arsenal of rigorous statistical tests have corroborated the profit making potential of such strategies. The “momentum” effect as such trending seeking behavior has become known has even joined the widely accepted Fama/French three factor model (market, value and size) as the fourth identifiable factor. The most common representation of the momentum factor involves a measure of price persistence such as the last 12 months of total returns. Many variations on this theme exist including making an allowance for stock risk. In our various equity strategies at Global Focus Capital we employ momentum factors as part of our list of key market indicators. In this note we present an approach that seeks to identify technical stages of a stock behavior based on the relationship among the current price and that of moving averages of varying length. Specifically, in this note we use our intermediate technical stage classification system which employs 50 and 200 day moving averages in relation to the current price. We use our classification system to better understand the price behavior of individual stocks and also as a way to distill information about the positioning of the overall equity market. Without going into all the construction details, essentially what our technical stage classification does is allocate each stock into one of six buckets as shown in Diagram 1. The idea is that the average stock moves clockwise and cycles through the various technical stages. The stage in which a stock resides can imply significantly different return expectations. The “glamor” bucket is the Up Trend Stage where the current price exceeds the 50 and 200 day moving averages and the 50 day average is higher than the 200 day average. Visually, the price chart on this stock would show a relatively steady rising price. Under normal market conditions stocks in the Up Trend stage perform the best. The exception is in periods immediately following big market declines. On the other end of the spectrum resides the Down Trend Stage. Stocks in this group are frequently referred to as “dogs”. The current price is trending down below the 50 and 200 day moving averages and the price decline is accelerating. Portfolio managers hate owning these stocks unless they can spot a catalyst (usually valuation driven) that within a reasonable time period would jump-start a price recovery. Some of the future stock home runs reside in the Down Trend Stage but, on average, stocks in this bucket perform the worst within our universe. Beside the Up and Down Trend Classifications what else is there? Contiguous to either extreme lie a couple of technical stages manifesting different levels of improvement or deterioration. Let’s start from the bottom and work our way clockwise. When a stock sits in the Down Trend Stage and its stock price starts slowly improving (current price above its 50 day moving average) our classification system would place that stock in the Improving Stage. If the stock price continues appreciating but with some recent setbacks where the current price surpasses both moving averages then the stock would fall in the Break Out Stage. In both of these zones there is still some hesitancy to describe the behavior as fully trending but sentiment toward stocks in these stages is clearly on the rise. Under normal market conditions both the Improving and Break Out Stages enjoy above-average rates of return. In both of these early momentum stages investors have started sniffing around and possibly initiating small exposures. Deep value investors that typically enter into a stock position when in the Down Trend Stage are most likely seeing portions of their thesis pan out and hence the stock price is appreciating. Moving through the Up Trend Stage we find the Deteriorating and Break Down Stages. Basically what is happening here is that the stock has started losing its mojo first in a small way and later on in a major way. Sentiment has started turning on the stock. In the Deteriorating Stage the current price has fallen behind the 50 day moving average while still exceeding the longer-term moving average of 200 days. The 50 day average also exceeds the 200 day average. Cracks are emerging and investors are no longer in a blissful state. In the Break Down Stage the situation is more dire. Now the current price is below both the shorter and longer moving averages. The 50 day moving average is, however, still above the 200 day average. To provide additional context Table 1 shows three large stocks by market capitalization fitting each one of our technical stages. In addition we present the current proportions of stocks in our global universe in each of the classifications along with the long-term average proportions. How does the current Technical Stage Classification configuration compare to History and are there any Market-wide Implications? The percentages shown in Table 1 correspond to the current technical stage breakdown for our global equity universe of approximately 14000 securities. For example, we currently classify 29% of our stocks in the Up Trend and 24% in the Down Trend Stage. These percentages reflect the internal state of equity markets. During a raging bull market a large percentage of stocks will naturally sit in the Up Trend Stage. During the early stages of a nascent bull market there will be a large number of stocks migrating from the Down Trend Stage to the Improving and Break Out categories. Similarly, as the breath of global equity markets thins out toward the tail end of a bull market the proportion of stocks migrating from the Up Trend category to the Deteriorating and Break Down groups grows over time. Conversely, when the overall market is in a bear market such as during the 2008/2009 period an increasing percentage of stocks will naturally reside in the Down Trend Stage and as the broad market recovers the proportion of stocks moving to the Improving and Break Out stages should increase. In normal type of markets most stocks will reside in the extremes of Up Trend and Down Trend with smaller proportions in the four other stages. In Figure 1 we highlight the differences for each stage relative to their long-term average. The first clue is the lower than historical proportion of companies are in the Up Trend Stage (7% below the 25 year average). Another hint of a change in market tone is given by the significantly higher than average proportion of stocks in the Deteriorating (+10%) and Break Down (+9%) phases. Focusing only on the glamor Up Trend stocks we have seen a significant downward migration from the beginning of the year. 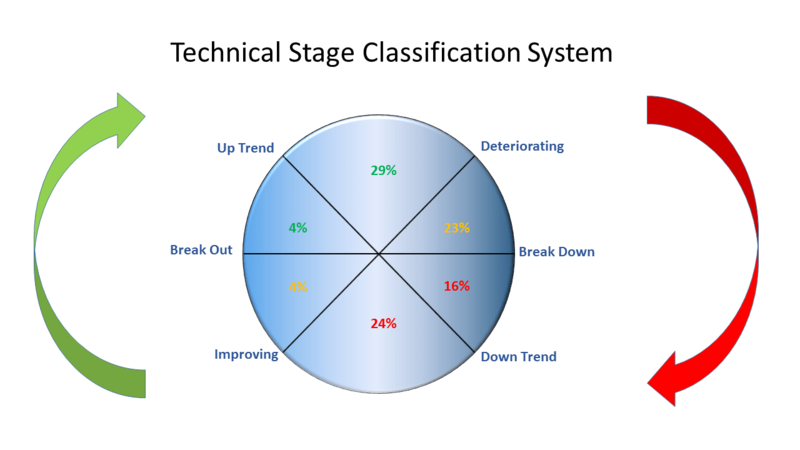 Figure 2 shows the current technical stage classification for those stocks in the Up Trend stage at the beginning of the year. Typically, during a bull market about 50% of the stocks in the Up Trend category remain in the same bucket (we refer to this as the status quo effect). Where are yesterday’s winners? 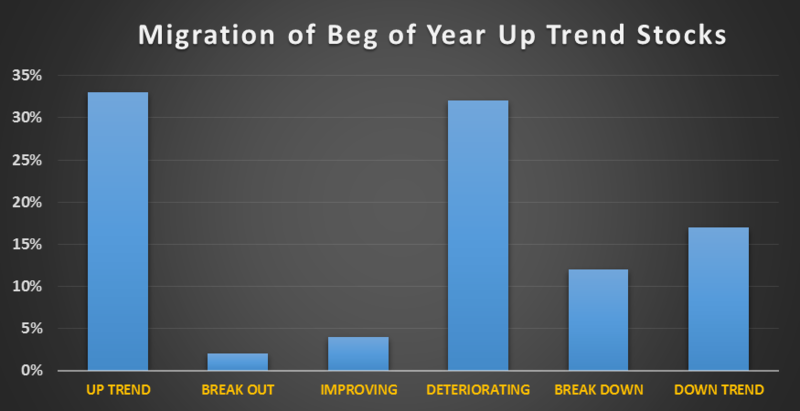 Currently the percentage of repeating Up Trend stocks (from the beginning of the year) stands at 33%., a significant drop from the 50% expected repeat rate. Moreover, a large percentage of these UP Trend stocks have migrated to the Deteriorating stage indicating a loss of price momentum. Are we headed toward a large equity market correction? The about average proportion of companies in the Down Trend Stage does not indicate that a large correction is imminent at least from a technical standpoint. Typically, during the last leg of a long-running bull market what you see is a narrowing market with only a few stalwarts carrying the momentum torch. Normally we would be seeing a larger proportion of companies already in the Down Trend category. What we are seeing in the technical data could be best described as a pause and in our view the likelihood of a large correction will be more of a function of fundamentals and valuations. The technical picture should corroborate the fundamental and valuation picture in our opinion not be the driving force behind our view of the health of global equity markets. So, what might be causing this pause in the global equity markets? Without devolving into a deep dive into valuations let’s just say that current global equity market valuations appear expensive when judged relative to traditional historical norms (meaning multiples such as the Shiller P/E) but inexpensive when adjusted for the current inflation and interest rate environment. In addition, the fundamental growth and profitability outlook is yet another rather important determinant of equity market valuation that sometimes gets lost in all the hoopla over valuations. In our opinion, the current bull market pause is due to an increase in uncertainty regarding the path of future interest rates, inflation, and profit growth. Absolute valuations using traditional metrics such as P/E’s have looked stretched for several years already yet equity markets have delivered attractive returns. Except for a brief period post Financial Crisis the Shiller P/E has, for example, pointed to an overvalued US equity market. Clearly current valuation multiples will dampen prospective longer-term returns, but in our opinion something else is brewing. So what has changed recently? For one, we know that the Federal Reserve is committed to raising short-term rates starting this year. Investors have known about this possibility for at least one full year. But does that mean that rates in the US will immediately revert back to historical averages? We do not think so. In fact, our belief is that we are going to be living in an environment of low nominal and real rates for a long time. Monetary stimulus is also more than a function of Federal Reserve behavior. The ECB and the BOJ are still in full stimulus mode. The Chinese central bank is also pumping additional liquidity into the system. Monetary policy is implemented locally but its effects are global in reach. As long as the net effect of global monetary policies remains expansionary interest rates will remain anchored to lower than normal levels. Moreover, the furthest thing from central banker’s minds is inflation. Commodities appear headed for a severe multi-year bear market and while pockets of economic activity exhibit upward price pressures it seems to us that global economic activity is too subdued to lead to any significant uptick in excess demand to soup up all the slack capacity around the globe. Predictions of rampant inflation are today as rare as a NFL Commissioner Roger Goodell fan in New England! What does a subdued economic environment mean for profit growth? The link between economic growth (say GDP) and corporate profitability can be tenuous on a year by year basis, but over the long-term EPS growth and global economic growth are inexorably tied together albeit in an imperfect manner. So what is happening to growth? In general GDP growth expectations are being revised marginally down. The World Bank recently lowered their forecast of global growth from 3 to 2.8%. China is clearly slowing down (expected growth of 6.5%) and many other large emerging markets such as Brazil and Russia remain in the doldrums. It is unclear what the lasting effect of the Greece debt resolution is for European growth but in any case one can say that the outlook is definitely more uncertain than at the beginning of the year. Japan despite all the massive stimulus is barely expected to grow in 2015. That leaves us with the US as the key contributor of global growth with GDP expected to rise 2.9% (according to The Conference Board) this year. But let’s just say that there is some skepticism around this forecast in light of the below expectations Q2 2.3% reading and the sometimes downbeat commentary of cyclically sensitive companies (the most recent example being UPS). Does this mean that EPS growth will be terrible this year? Not necessarily as the link from GDP to EPS is often noisy in the short-term. Let’s start with Japanese stocks. The Nikkei 225 is expected to show EPS growth of 15% this year and 10% for 2016. Not bad given the barely noticeable GDP growth in Japan. What about Europe? Using the STOXX 600 as the broad barometer for European equities analysts expect to see close to a 9% growth in EPS for this year and 11% for next year. Again, not too shabby given all the headline news coming out of the continent. These expectations have remained sticky during the last three months of Greek drama and Chinese upheaval. Surprisingly, the trouble spot in terms of EPS growth appears to be the US. While the US economy is expected to have close to normal growth, public company earnings are expected to be uninspiring. For the S&P 500, as an example, 2015 EPS is expected to grow slightly north of 1% down from the 5% growth rate observed last year. This number has been revised down in the last quarter from slightly over 2%. Growth in 2016 is expected to jump up to close to 11%, but year-ahead projections typically carry significant upward bias. What does this all mean for equity market returns? The current pause in the equity bull market is, in our opinion, a reflection of investor worries about growth. We do not think that current uncertainty about inflation or interest rates merits a place at the dinner table. Inflation does not seem to be an issue given all the slack capacity in the world and the likely tightening of monetary policy in the US is mostly offset by the loose money policies of the ECB, BOJ and the Chinese Central Bank. What about valuations? Equity market valuations are high when measured using traditional metrics such as P/E’s. However, when adjusted for growth potential, inflation and the cost of money equity markets appear to be reasonably priced. For example, Professor Aswath Damodoran of NYU using a discounted cash flow methodology arrives at a prospective S&P 500 return of approximately 8%. We are not advocating ignoring valuations especially when thinking about multi-year equity market expected returns. But in terms of thinking about today’s markets we do not see valuations providing a strong enough catalyst for a large equity market downdraft. In our opinion the factor creating the biggest headache for global investors is growth. Specifically, uncertainty about the growth profile of the global economy and by association the profit outlook for global equities. Our view is that global growth is marginally slower than at the beginning of the year and specifically in terms of EPS growth we see the biggest vulnerability in commodity related sectors. While interest rate sensitive sectors (mainly utilities, telecom and real estate) remain under pressure given the changing stance of Federal Reserve policy we subscribe to a low interest rate scenario for the foreseeable future. Granted some of these interest rate sectors have been bid up in the “alternative yield trade” but as we mentioned before we do not think that valuations alone will provide the trigger for an equity market correction. At Global Focus Capital we remain overweight equities and real estate in our asset allocation strategies despite potential growth hiccups. In terms of sectors we favor growth-oriented sectors such as Health Care and Technology as well as direct beneficiaries of lower commodity prices namely Process Industries. Contact us at Global Focus Capital LLC (info@gf-cap.com) to find out how we can help with your investment needs. Download a PDF version of the report here or sign up below to subscribe to our blog.